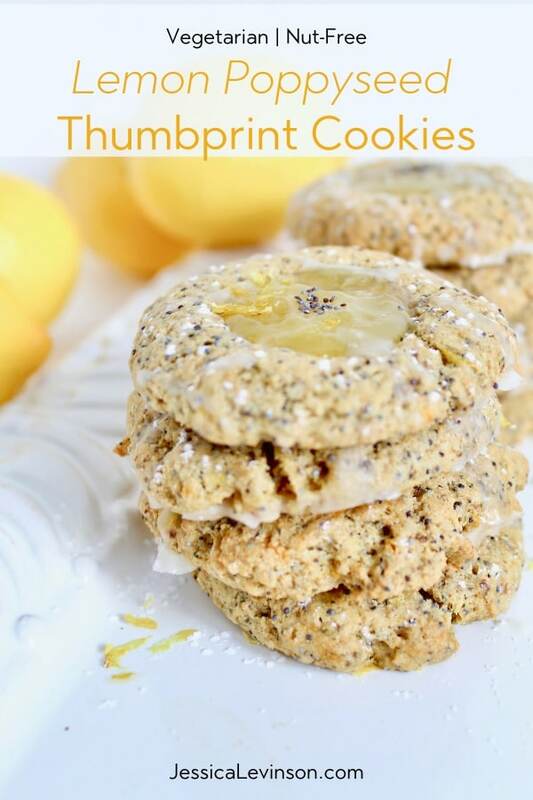 Welcome spring with this sweet and tangy Lemon Poppy Seed Thumbprint Cookie recipe bursting with bright flavor! I don’t know about you, but around here spring hasn’t exactly sprung quite yet. Unless somehow snow showers bring May flowers nowadays, but as far as I’m concerned I am ready for some sunshine. 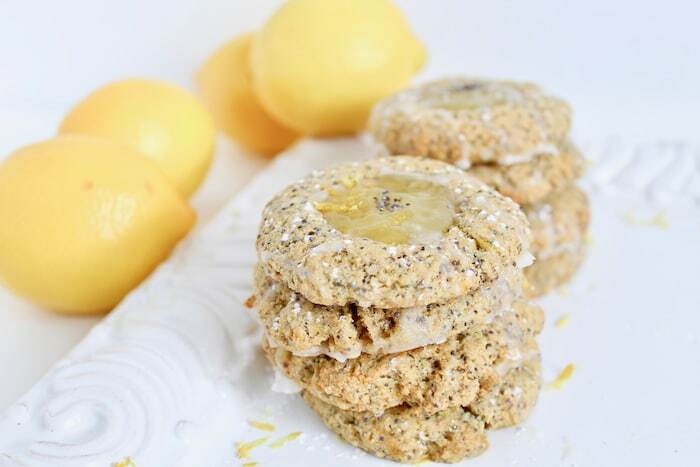 Lemon to me just screams spring, and these cookies have plenty of that going on. Lemon juice, lemon zest, and the sweet and creamy tang of lemon curd. If you could capture spring sunshine in a jar, it would in fact be lemon curd. If you’ve never had lemon curd before, it’s almost like a lemon jam or jelly, but a lot creamier thanks to the fact that butter and eggs are added during the cooking process. You can find it at most grocery stores with all the other preserves, or if you’re feeling adventurous and live where lemons are aplenty, you can make your own. We can’t forget the other half of this dynamic flavor duo, the poppy seeds! In addition to adding that tiny bit of crunch in every bite, poppy seeds are a great source of the minerals calcium, phosphorus, and zinc, which are great for building bone health and immunity. Who knew these tiny little seeds could pack so much nutrition in such a small package! These thumbprint cookies are made a little healthier too since I used less sugar and butter, and whole grain white whole wheat flour instead of all purpose white flour for a little added boost of fiber. I’m pretty sure nana never used whole wheat flour in her pound cake. If you’re in need of a little brightness and sunshine this season, these cookies will certainly deliver! 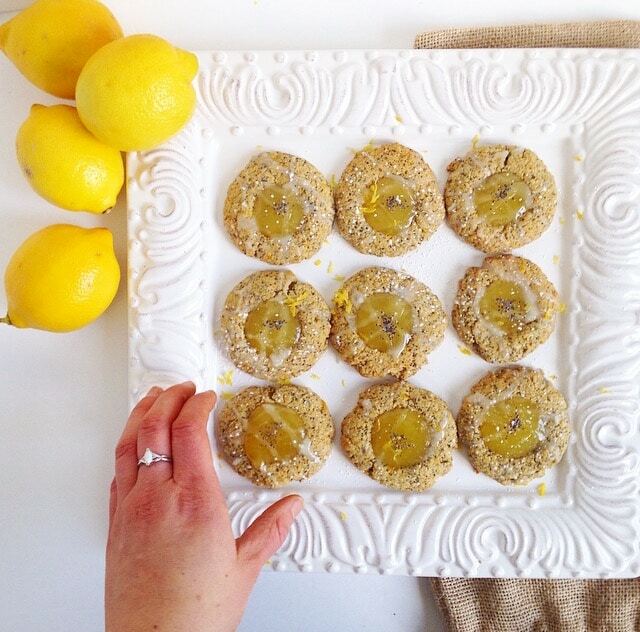 Welcome spring with these sweet and tangy Lemon Poppy Seed Thumbprint Cookies! 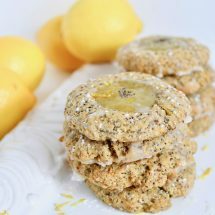 Soft and chewy lemon poppy seed cookies are dolloped with zesty lemon curd and a simple glaze for the perfect springtime treat. Preheat oven to 350°F. Line a baking sheet with parchment paper, or spray with non-stick cooking spray and set aside. In a large bowl, mix together flour, sugar, baking soda, and salt. Add softened butter, egg, vanilla, lemon juice, milk, lemon zest, and poppy seeds to flour. Stir to combine until dough forms. Roll dough into 12 balls, and place each two inches apart on prepared baking sheet. Gently flatten each cookie with fingers, and bake them in the oven for 7 to 8 minutes, or until slightly golden but still soft. Remove cookies from oven and use a tablespoon to make an indentation in the middle of each cookie. Let cool for 5 minutes. In a microwave-safe bowl, combine lemon curd and lemon juice. Microwave on high for 30 seconds, stir, and fill each cookie with 1 teaspoon of lemon curd. In a separate bowl, whisk together powdered sugar and lemon juice. Add additional lemon juice if glaze is too thick. Drizzle glaze over cookies, and let dry on wire cooling rack for 10 minutes. What’s your favorite springtime treat? Do you have a favorite way to cook or bake with lemon? I am loving all the lemon recipes everywhere this time of year. These look divine! Nothing says warmer days ahead as much as lemons! These looks great! Aw. I grew up eating thumbprint cookies These bring back great memories. Looks delicious. So fun to hear these bring back memories for you. Hope they are as sweet and delicious as you remember! These look so soft and chewy! Lemon screams spring to me too! 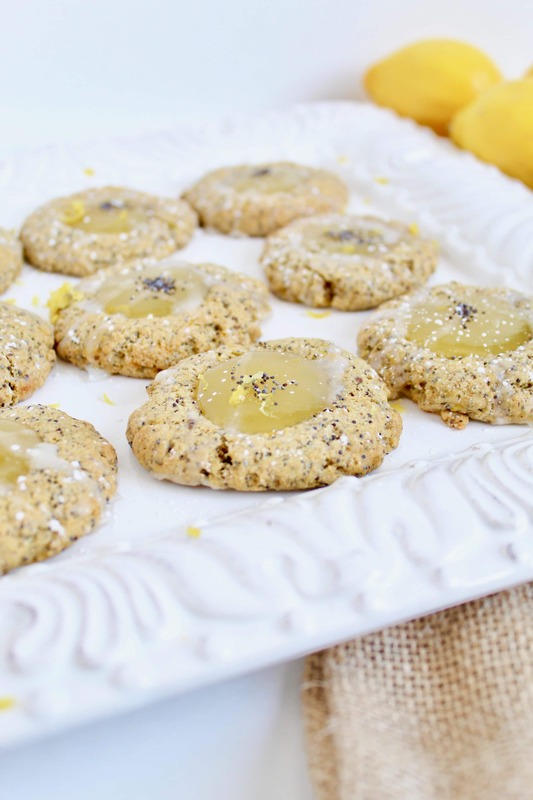 And so do these lemon poppy seed thumbprint cookies! They are! Thanks Lindsay – I hope you enjoy them! Oh my goodness these look good! I’m loving lemon so much lately and these would be perfect for this weekend if I can pull them off. Of course perfect anytime. Thanks Sarah! I can’t wait to make a batch too. I think you will love them and hope you get a chance to make them! Hope you enjoy these Maria! What gorgeous cookies! I really love lemon flavor and have been on a kick with it lately! Looks so good. Thanks Julie! Hope you give these a try and enjoy them! Yum! I am normally not a lemon person but lately I have been all over lemon recipes!!! I will be pinning these! I used to not be a lemon in dessert person either, but absolutely love it now! Hope you give them a try and thanks for pinning! Oh wow! I love that lemon curd is used in these! It’s one of my all time favorite ingredients! Yum! Thanks Sara – I’ll have to let Emily know. I have actually never used it before, but am so excited to now!!! These cookies are so perfect for Spring! Lemon flavor is a favorite of mine! I absolutely agree Ilka! Thanks! Lemon Poppyseed is the best flavor. I friggin’ ADORE IT – which is interesting because I am generally NOT a lemon flavored fan! Thanks GiGi! Hope you love them! Do you bake and deliver? I’ll take 2 dozen please. My husband is a big lemon fan. He would love these cookies. Haha…we’ll have to ask Emily about delivery! I would love for her to deliver a batch to me too! Hope your hubby gets the opp to enjoy these! Ohhh these look scrumptious! Love lemon cookies! Thanks Whitney! LMK if you give them a try! Lemon and poppyseed…always a fantastic combo! Thanks Tara! Hope you enjoy! These look so tasty, I’m a lemon lover so I’ll definitely be trying these! Thanks Lauren- can’t wait to hear how you like them! oh my… thumbprint cookies with lemon curd. you have me drooling! Given you’re baking hands, that’s a huge compliment Gretchen! Thank you! Lemon poppyseed is one of my favorite combinations. Love this healthy take on a cookie, can’t wait to try these! What a creative cookie! I absolutely love lemons so I know I would love these! Thanks Betsy – I hope you do! Lemon is FOR SURE such a spring flavor! YUM! It sure is! Hope you try these soon Chelsey! Yum, these sounds so perfectly fresh for spring. Lemon and poppyseed are so good together and I love that you made them into thumbprints, so cute! Thanks Deryn, they are so delicious! Hope you try them soon! These sound like the perfect spring-time treat! Thanks Nicole! Hope you make a batch soon! These cookies are so cute and definitely say spring! The weather here in Utah definitely can’t make it’s mind up yet, but maybe making a batch of these yummy cookies will help! The weather here in NY can’t either -we had 4-6 inches of snow today! I’m definitely ready for these cookies and as much spring as possible. Gosh, I’ll even take summer at this point! I’m so in love with these cookies already. Can’t wait til they are mine! These cookies are most definitely a dose of sunshine and happiness! I love the bight lemon flavor for spring! They sure are! Thanks Emily. Hope you enjoy some spring and cookies soon. These look so yummy!! If I run to the kitchen now and make them will it stop snowing? Either way it would still be perfect, spring flavor and baking comfort food cookies while it snows! Haha, right?! So ready for spring and all that it entails – including these cookies! Love thumbprint cookies! And really loving the lemon poppy seed flavor. So perfect for spring! Thanks Christine. Hope you enjoy them soon! These are adorable. You know, I don’t think I’ve ever had lemon curd. I think I need to give this a try. Thanks Alisa. This was my first time using lemon curd! Now I’m looking for things to use it with more! HI Jessica! I love lemon flavors! These cookies look dreamy! Thanks so much Julie! Hope you try them soon! These look so springy and refreshing! Thanks Tara. Hope you enjoy them soon! these look absolutely delicious! I’m so ready for everything lemon flavored! Thanks Deborah. Hope you make them soon! Thanks Abbey. They’re great for baby showers, Mother’s Day brunch, or any occasion! haha…we never had cookies like this when i was growing up too. I didn’t even like lemon-y deserts until recently! I love any dessert that’s lemon-flavoured! These cookies sound so fresh and delicious for Spring! Thanks Elysia, they are. Hope you make some soon! Oh yum. I haven’t made thumbprint cookies in a really long time. Love the flavor combo’s of this recipe! Hope you make them soon Mikki! They are really delish. These are right up my alley. I can’t wait for it to warm up for more lemony desserts! I can’t wait for it to warm up too! Enjoy when you get to make them! Oh my goodness – Yum! These are so pretty and perfect for parties for Spring and Summer! They are so good! Definitely. Hope you enjoy Kalee! I love anything with the lemon! These cookies look so delicious and a perfect recipe for Spring!! You will love these Angela. Hope you enjoy some soon!